Several couples or a group of individuals could easily share Villa Saengootsa and enjoy a gentle combination of personal relaxation time and social moments by the pool or sharing meals on the ocean view BBQ terrace. Exclusive additions such as sunken outdoor bathtubs on the bedroom terraces add options for private indulgence and sunset gatherings will quickly become an integral part of the daily routine of pleasures. Colleagues on a team building or planning retreat can easily share Villa Saengootsa for creative team building exercises or strategic brainstorm sessions in a variety of inspired spaces. Broadband WiFi guarantees constant connectivity amidst peaceful surroundings, while the bright and airy study offers a private sanctuary to focus on productive work. The sophisticated spaces and open-plan design of Villa Saengootsa make it the perfect accommodation choice for a group of friends to share and enjoy. The wide sun terrace plus dedicated AV room and attached games room encourage a communal holiday atmosphere, while particularly inviting indoor and al fresco dining areas are conducive to shared moments. Proximity to the shopping and nightlife of Patong also makes this a fabulous luxury base for group outings and adventures. Villa Saengootsa is a sophisticated luxury haven, carefully crafted to suit its spectacular surroundings. 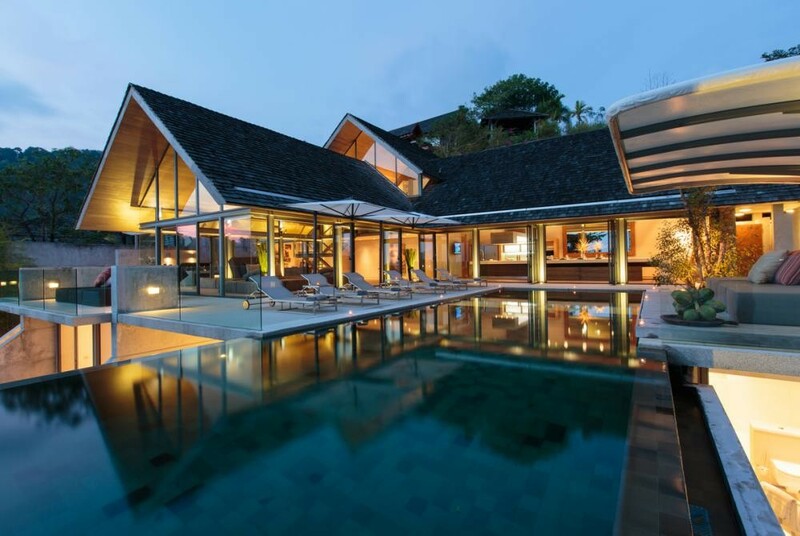 Built as a private holiday home by the architect who designed the entire Samsara Estate, clean lines and geometric angles hint at the homeowner's artistic profession – softened with plush furnishings and enlivened with colorful artwork – to create an overall atmosphere of modern tropical minimalism. An entrance staircase descends dramatically from the foyer into the main living room, an airy space featuring a custom-made oversize sofa suite, its stark modular lines mirroring the panoramic ocean horizon sweeping as wide as the eye can see. Guests can effortlessly drift between the villa’s multidimensional spaces, indoor and out; the glass enclosure of the double-height central lounge can be slid all the way open to allow the space to flow seamlessly from the outdoor dining area, through the lounge and out onto the al fresco pool terrace and open air relaxation pavilion. Oozing industrial chic, the covered outdoor dining space features a top-of-the-line barbecue unit built into the granite island kitchen counter and a long dinner table and benches made of matching brushed concrete. The addition of a poolside sala, perched on the corner of the plot and overlooking the Andaman sea, means sundowner rituals easily become an irresistible part of the stay. Meanwhile, an on-site office, dedicated AV room and attached games room with billiards table ensure there’s plenty to keep friends or colleagues entertained after a day of exploring or brainstorming without ever leaving the villa’s enchanting view-soaked surrounds. Just as communal mix-and-mingle spaces abound, five spacious bedrooms await their guests and offer private retreat at the end of an activity-packed day. Outdoor bathtubs are sunken into the private terraces of three en-suite rooms, while master bedroom guests are invited for an extended al fresco soak on their secluded terrace. Villa Saengootsa is tended by two discreet live-in staff: one chef and one housekeeper. The Samsara Estate front office team and villa concierge complement the villa's permanent staff to organize customized requirements and satisfy any holiday whims. We offer reduced occupancy rates depending on number of bedrooms, please ask when you enquire. 1. Rates are in USD per villa per night and are inclusive of applicable government taxes. 2. A resident chef and housekeeper/butler staff each villa. Their service is included in the price of the villa rental. 3. Samsara employs a Villa Concierge who contacts each party prior to their arrival. The Concierge coordinates airport transfers, stocking the villa with favored f & b items, menu selection and all other pre-arrival needs. 4. While the guests are in residence, the Concierge can also arrange home spa treatments, island excursions, golf bookings and other personalized requests. 5. Guests are met at the airport and escorted to the villa. Two separate airport pick-ups and two airport drop-offs are provided free of charge. 6. Check in time is 1400 and check out time is 1100. Early check in and late check out requests are subject to availability and later amendment. 7. All expenses while in residence are charged to the guest at cost + 7% VAT & 20% service charge. This includes all goods & services purchased on behalf of the guest, being mostly f & b, but also including transportation, massages, entertainment, and breakage. 8. Fiber optic wireless Internet access is complimentary. 9. Daily linen service (sheets and towels) is complimentary. 10. Samsara maintains a small inventory of baby cots and highchairs. Their use is free of charge. A deposit payment, equal to 50% of the gross rental amount, is required to confirm bookings. A balance payment, equal to 50% of the gross rental amount is due 30 days prior to arrival or 60 days in case of peak season bookings. On occasion, for short duration bookings, the $1,500 figure may be lowered. Similarly, for longer stays, the security deposit may be increased. Once received, all monies except the security deposit are non-refundable. In case of cancellation, the villa owner may, at his absolute discretion, decide on the status of all monies paid. Historically, villa owners have in almost all cases issued a credit to be used by the guest or his designee for a stay of equal duration and season within one year from the original booking dates.